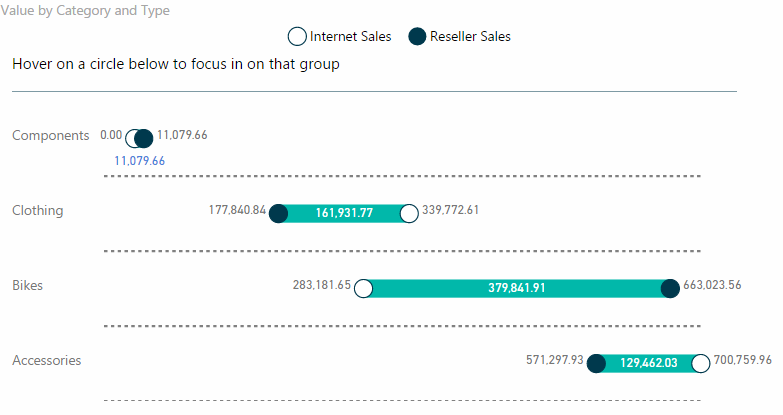 Thanks Travis Sansome from AllAboutData for submitting ‘Gap Analysis’ visual to the Power BI Visuals gallery and the below blog content. · Did one group respond more favorably to a certain category? · Was there a large gap between two different groups in a category? · Was the large gap in our most important category? · What is the sample size of the group I’m hovering over? By visualizing the relative positions of the group on a scale, the distance between the two circles indicates the gap whilst the ordering of the circles indicates which group was greater than the other. So let’s walk through two examples. In the survey, you had a series of questions. You then asked two different groups (Male, Female) whether they agreed to a question. We would use the Gap Analysis visualization to picture the number of Males who agreed with the question as compared to the number of Females. The categories known as statements, would be our questions whilst the Group would be our Gender column. We would then use the metric of the number who agreed. We might find that for some question’s there was a large gap between Male and Female who agreed with it. We might also find for different questions the ordering was reversed where Males or Females felt stronger about a question. Another example might be in marketing. It’s common to divide marketing into two different approaches. One being our direct marketing where we target directly a demographic with a customized message. This usually is in the medium of things like television, magazine ads, billboards and telemarketing. Indirect marketing is all about social media accounts, blogs, newsletters. It concentrates on building customer trust and loyalty, fans of the brand! So suppose you had the profit generated by both approaches. Your boss is interested to see how the two approaches worked in the various campaigns the company ran this year. Using the Gap Analysis visualization, it would be easy to show for which campaigns the indirect marketing approach stood above the direct marketing approach or vice versa. The visualization is completely customizable with all the formatting options you could want and need. Be sure to check out the video below to see it in action. Maybe even get a quick start on how to use it as well. 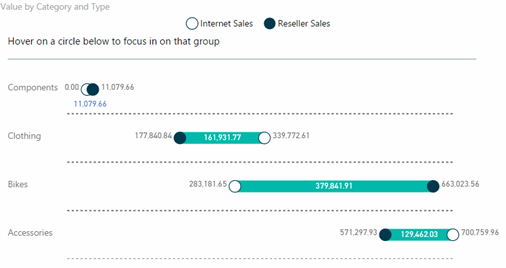 To use, simply download Gap Analysis visual from the visuals gallery and import it to your Power BI report and use it. Please use the ‘Contact Author’ link in the visual to share your thoughts and ideas for improvements.